This helps a lot when editing a site, where cache contain should be updated regularly. Thank you very much! concrete5's caching function is awesome, but when it comes to a trouble shooting, caches will be an obstacle. This addon checks the login attempt. 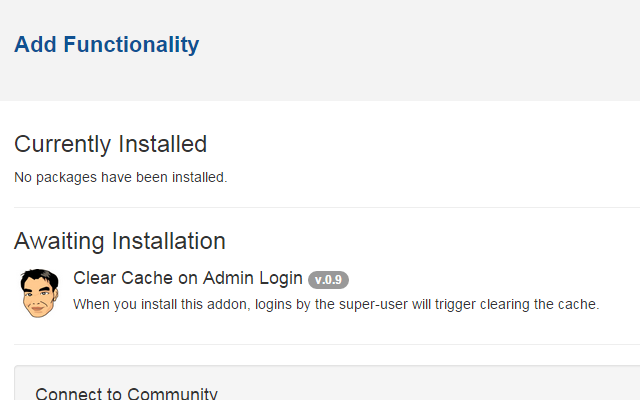 If the Super-User (user id 1) logins, this addon triggers clearing the cache. It will save your time, since you don't have to clear cache manually. This addon has a single functionality: clearing the cache on admin login. When you install this addon, this functionality will be active. When you uninstall this addon, this functionality will be inactive. Hence no setting page for this addon.